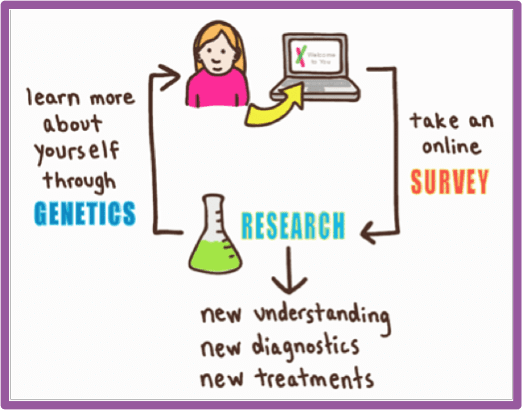 Most people know 23andMe empowers people to learn about themselves through their genetic information, but perhaps fewer know that a major part of our mission is to advance research. As the recent controversy involving a joint study published from Facebook and Cornell University on emotional contagion brought the idea of research ethics to the top of people’s minds, it might be helpful to review some of the highlights of our own research program. Our research program is built on the ethical principles laid out in the Belmont Report, which basically describes guidelines for treating people right in research. However, much of 23andMe’s research actually adheres to a much stricter federal standard called the Common Rule. Although technically only federally funded research has to meet that standard, 23andMe voluntarily applies it to our own internal research. 23andMe invites every customer to join our research program, and our goal is to be as clear as possible about what the research involves, so people can make a well-informed decision to participate or not. To take part, a customer must consent to research. The consent agreement describes what the research is about, as well as the benefits and risks of participation. Choosing not to take part doesn’t impact a customer’s access to the rest of the 23andMe service, and if a customer initially decides to join the research program but changes her mind later, she can simply change the settings in her account and leave the study. Our entire research program is overseen by an external and independent ethics committee known as an institutional review board, or IRB. The job of the IRB is to review and monitor our research to make sure that the people taking part in the research are fully informed about the risks and benefits of participating. Since 2009, we have been working with an independent IRB, Ethical And Independent Review Services, and they have been a great partner and guide to us as we strive to break the boundaries of traditional biomedical research while prioritizing the welfare of our customers. Every one of our researchers undergoes training on protecting human subjects as well as the responsible conduct of research. We also have a team dedicated to making sure all our work follows the federal regulations and the instructions of our IRB. While we have great geneticists and scientists on staff, we also recognize that we’re not experts on everything. We want to respect the enormous contributions of our customers by making the most of the information they’ve shared. One of the most important ways we can help accelerate research is to get the world’s best scientists working on the data. To this end, we regularly partner with experts from academic, government and industry research centers. In these collaborations, we share only de-identified data from a large group of participants. This ensures that research participants remain anonymous and that their names or personal identifying information is not connected to the genetic data used in research. If for any reason, a project would involve sharing the genetic information or survey answers of a single person, we get specific additional consent from that individual before the project moves forward. On average, it now takes more than a decade and about $4 Billion to $11 Billion to bring a new drug to market. But 23andMe’s new model for research can fuel discoveries and help bring new therapies to market more quickly and efficiently. Thank you to each and every person who has opted-in to our research program and made the time to answer the questions we have put out there – from your family history of cancer to size of your feet. All of this information is helping us to better understand how DNA influences human biology. We hope you are proud of the contribution you are making and are clear on how your data will be used in these efforts. Go here, to see some of the research papers our scientists have published.